The new Funmi Iyanda show, Talk with Funmi, starts in January. I've just seen the preview DVD. Its just brilliant. 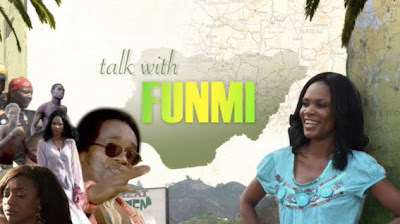 Funmi spends the whole time out and about meeting larger than life characters. Whether its learning tricks from highly flexible dancers in AJ City, absorbing the eccentric exuberance that is Victor Uwaifo, playing footie with the surprisingly agile Governor Fashola, walking deep into the forest with a traditional hunter in Oyo State, biking in V.I. with Charlie Boy (and creating an okada flash-mob in the process) or just hanging with the perfectly nice 9ice and his mate Wande Coal, Funmi has created a winning formula. I'm sure its going to be a hit. It reminds everyone about what's good about Nigeria and somehow it captures the essence of hope here. Go Funmi! omo, naija keeps getting better.